We may be used to the idea of showering indoors but did you know that having a shower outdoors is so much more invigorating? Some of us may be worried about privacy but as long as you have adequate space and with good planning, you can have a secure and stylish outdoor shower. Having an outdoor shower means that you can be one with nature and this wooden shower perfectly encompasses this and is also a classic style. All you need is a few green plants to keep with the nature theme. If you want some zen in your outdoor shower then you can go for this natural stone look that is reminiscent of a spa. Keep the showerhead basic and simple so that it won’t distract from the beautiful stone wall. For those who prefer something more luxurious and grand, this outdoor shower is the one for you. It will look airy and spacious especially if you use a white palette as your main focus enhanced by pops of warm wood. You can add bathtubs as well if you have enough space for the ultimate luxury. 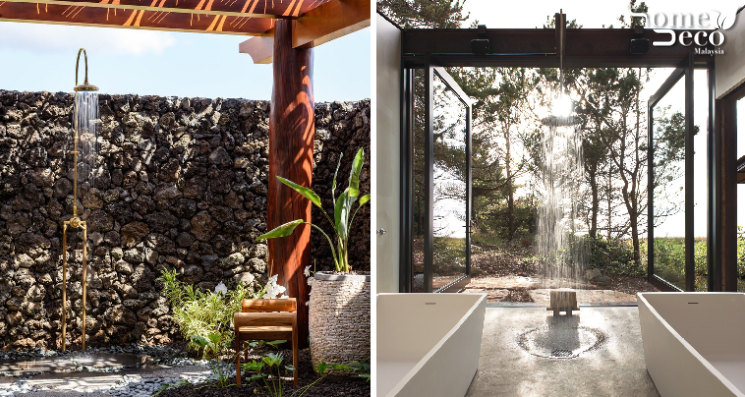 Even if you don’t have a lot of space at home, you can still have your dream outdoor shower that is just as beautiful and refreshing. Invest in a more luxurious showerhead and add splashes of colour for a fun, vacation-like atmosphere. If you don’t want to make a huge fuss over your outdoor shower, go ahead and turn it into an industrial style one. The use of concrete and some simple, clean lines will make a huge impact without going through a lot of trouble for an outdoor shower that rejuvenates your senses.